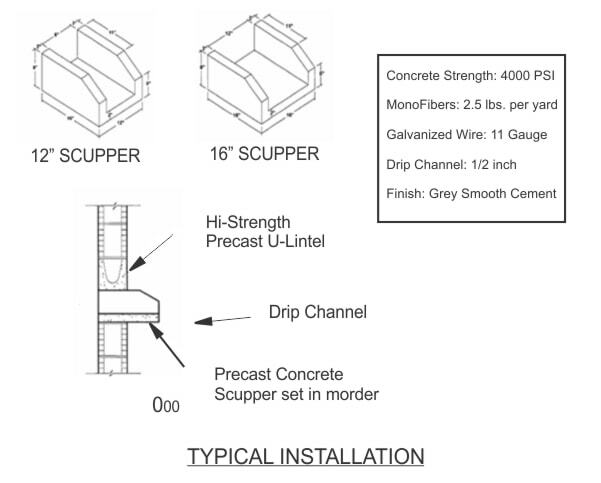 In Lauderhill, Precast Concrete Scuppers could be an important part of your rain gutter system. Whether your site is residential, commercial, or an industrial facility, Atlantic Coast Precast can produce cost-effective precast scuppers or downspout splash guards. Also called splash blocks, these blocks control draining by guiding runoff rainwater away from the foundation of your building, diffusing water away from your landscaping and preventing flooding in your basement. Since 1965, our team has been proud to work with industry professionals including contractors, designers, engineers, and architects to bring their visions to life. Our team can help you choose the right kind of Lauderhill Precast Concrete Scuppers for your needs, with options for both functional and decorative styles. We are also proud to offer larger scuppers for high velocity water flows. Commercial and industrial clients may find these splash blocks to be ideal. When runoff rainwater isn't quickly channeled away from your building, it could lead to costly damages like ponding water in your basement ceilings, walls, and crawlspaces or settlement in supporting structures like cracked slabs. At the very least, poor positioning for your Lauderhill precast concrete scuppers can cause splashing or mud stains on your walls. Atlantic Coast Precast will make sure your scuppers are placed correctly for the best results. Call for your FREE quote.